The story was that in the far future, humans colonized many planets and established a form a biotechnology, which were sentient beings called Compuminds, which could communicate rapidly from world to world. The game's villain had shut down all the Compuminds and hid them. Eventually one of the Compuminds, named Kakos, was found. 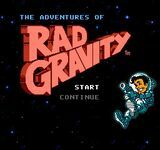 Rad Gravity is the name of the game's hero. Together, Rad and Kakos must find the eight missing Compuminds, each on eight different unique planets, such as the cyberpunk world of Cyberia, the green jungle world of Sauria, and the caustic trash world of Effluvia. Source: Wikipedia, The Adventures of Rad Gravity , available under the CC-BY-SA License.